The sun was beating down right from the offset in Salonta. I knew this was going to be a tough day and I think I lost the mental battle from mile 1. As I left the town a man offered me a melon from his truck. “Too heavy” I said. He then produced some apricots, apples and grapes and made a note of my website. What a very kind start to the day. I was a couple of minutes off yesterday’s pace and managed to reach Inand at lunchtime to eat the fruit and rest in a bus stop. I could feel myself nodding off so decided it would be best to get back on the road again. 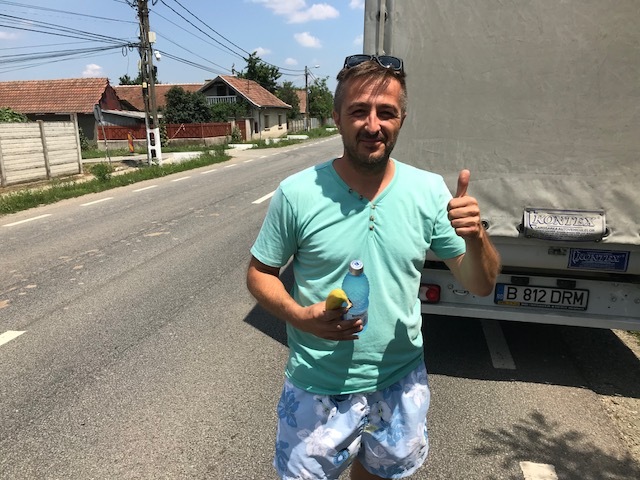 There was another act of kindness in the next village of Gepiu where a man handed me an ice cold bottle of water and a banana. “I’m English” I said. “I’m Romanian” I replied. I told him that I was travelling from Belgrade to Moscow and he seemed very surprised. 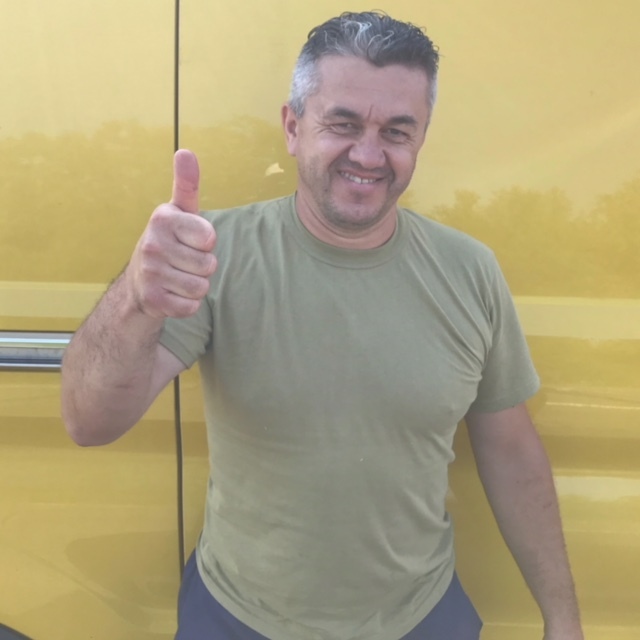 He shook my hand and wished me luck before heading off in his van. The ice cold water was amazing compared to the warm water that I’d been drinking all day. I made it to Les where I bought a big bottle of pop and sat outside the shop and drank it. Once again, I almost nodded off. The remaining 3.5 miles saw me run up some inclines and with the temperature in the 30s it wasn’t easy. I managed 18.7 miles before calling it a day. I wanted 18 miles at the start of the day. This sets me up nicely to get through the city of Oradea tomorrow morning. 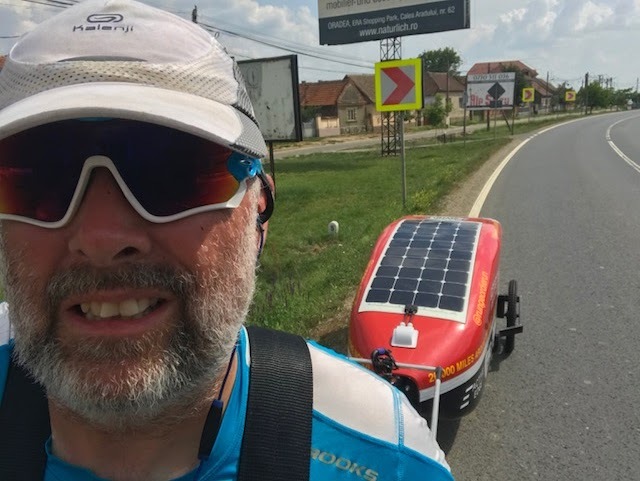 There are 88 miles to Satu Mare and 4 days left to run them. In other words, I remain on target to get there as scheduled on Sunday. 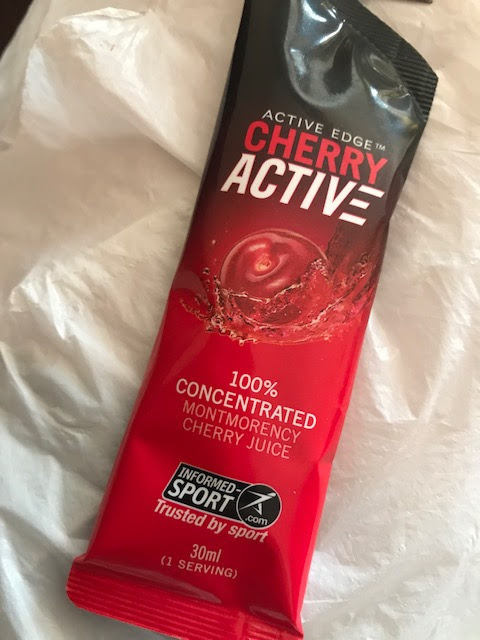 I’m writing this blog having just had my daily dose of Cherry Active. This is the reason why I don’t ache the morning after. Regular readers will know that this is my 7th year of using it and it’s been an important part of my recovery since the run across the USA in 2011. Going back to the mental battle and I seriously lost it today. Doubts crept in to my mind as to whether I’d be able to sustain this daily effort. Every mile is an absolute challenge and the 2 rest days in Satu Mare can’t come quick enough. Despite the daily difficulties that I face, I’m fully aware that I’m undertaking this challenge in aid of St Benedict’s Hospice. 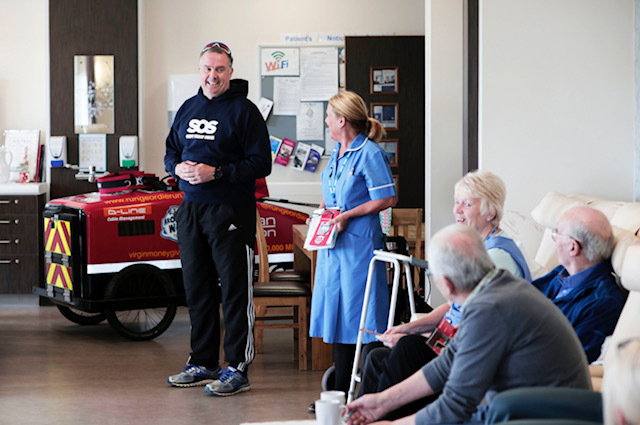 I’ll cast my mind back to last month where I spoke to the day patients at the Hospice. Some of those people may well no longer be with us. Tomorrow, I’m going to focus my mind on the people who the Hospice have helped. My Mam was one of those people of course. Four days of massive effort is required from me to reach Satu Mare by Sunday. Please sponsor me in aid of St Benedict’s Hospice if are you able via http://uk.virginmoneygiving.com/rungeordierun. Thanks to those kind people who have already donated and left a message on my Virgin Money Giving page. Your support is hugely appreciated and the current total for this campaign stands at £35,594.92. There is still a long way to go to hit my own personal target of £50,000 but I’m confident. It’s a significant amount for any charity and it’s all thanks to so many generous people.